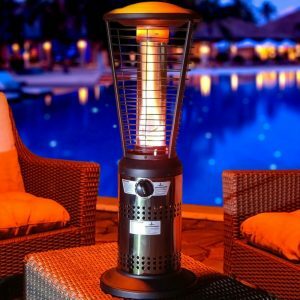 Although a little higher priced this table top patio heater received a 4.7 star rating our of 5 stars. This lava heat italia ember mini tabletop heater comes with a lot of nice features and here are the things we noticed first. 11x11x34 inches with a 19.1 LBS weight. Available in gun metal and heritage bronze. In this price range it is normal no to see a whole lot of people who leave reviews unless they are disappointing. 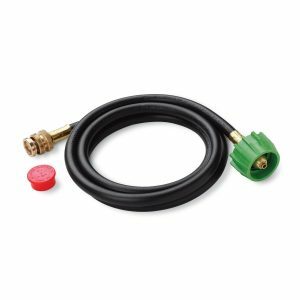 Since we already stated that this table top heater received a lot of 4 and 5 ratings out of 5 stars this only tells us again that you get what you pay for in many cases. We just noticed that there are more buyers for the Heritage bronze than for the gun metal colored heater. Technically they are the same and it is just a personal preference and depends on the decorum of your patio. Since all ratings are high we could not find any negative reviews. Most liked was the portability and the fact that it gives of enough heat. The cool touch feature of the outside was also mentioned as a nice feature compared to the cheaper brands and models. With no negative comments from buyers I think we can recommend this Lava Heat Italia Embermini as a very good buy. If we find more reviews that are less high we will add them here later.